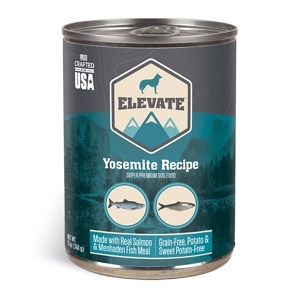 Our Yosemite Canned Recipe sets off on a food adventure, appealing to your dog in every moisture-packed bite, including real salmon, premium menhaden fish, and turkey. 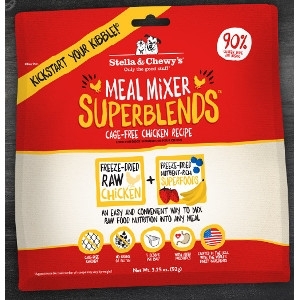 A powerful antioxidant blend of dried seaweed, cranberries, spinach, blueberries and more helps support the immune system and healthy digestion, while rich sources of Omega-3 and 6 promotes a healthy skin and coat. 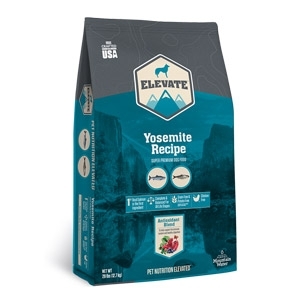 With real salmon as the #1 ingredient, our Yosemite Mountain Recipe sets off on a food adventure, appealing to your dog’s instinctual appetite. A powerful antioxidant blend of dried seaweed, cranberries, spinach, blueberries and more helps support the immune system and healthy digestion, while rich sources of Omega-3 and 6 promotes a healthy skin and coat. Our Grand Teton Canned Recipe journeys into nutritious terrain and appeals to your dog in every moisture-packed bite, including real lamb and turkey. A powerful antioxidant blend of dried seaweed, cranberries, spinach, blueberries and more helps support the immune system and healthy digestion, while rich sources of Omega-3 and 6 promotes a healthy skin and coat. With real lamb as the #1 ingredient, our Grand Teton Recipe journeys into nutritious terrain and appeals to your dog’s instinctual appetite. A powerful antioxidant blend of dried seaweed, cranberries, spinach, blueberries and more helps support the immune system and healthy digestion, while rich sources of Omega-3 and 6 promotes a healthy skin and coat. 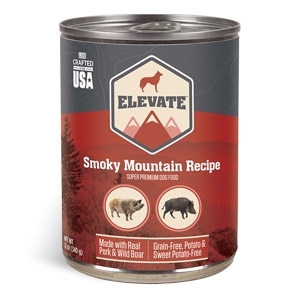 Our Smoky Mountain Canned Recipe reaches peak levels of protein, appealing to your dog in every moisture-packed bite, including real pork, premium wild boar, and lamb. A powerful antioxidant blend of dried seaweed, cranberries, spinach, blueberries and more helps support the immune system and healthy digestion, while rich sources of Omega-3 and 6 promotes a healthy skin and coat. 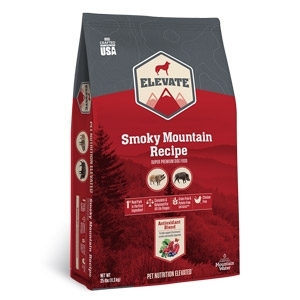 With real pork as the #1 ingredient, our Smoky Mountain Recipe reaches peak levels of protein, appealing to your dog’s instinctual appetite. A powerful antioxidant blend of dried seaweed, cranberries, spinach, blueberries and more helps support the immune system and healthy digestion, while rich sources of Omega-3 and 6 promotes a healthy skin and coat. Our Acadia Canned Recipe gets outside of the ordinary and appeals to your dog in every moisture-packed bite, including real chicken, turkey, and duck. A powerful antioxidant blend of dried seaweed, cranberries, spinach, blueberries and more helps support the immune system and healthy digestion, while rich sources of Omega-3 and 6 promotes a healthy skin and coat. 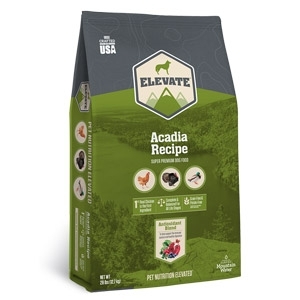 With real deboned chicken as the #1 ingredient, our Acadia Recipe gets outside of the ordinary and appeals to your dog’s instinctual appetite. A powerful antioxidant blend of dried seaweed, cranberries, spinach, blueberries and more helps support the immune system and healthy digestion, while rich sources of Omega-3 and 6 promotes a healthy skin and coat. 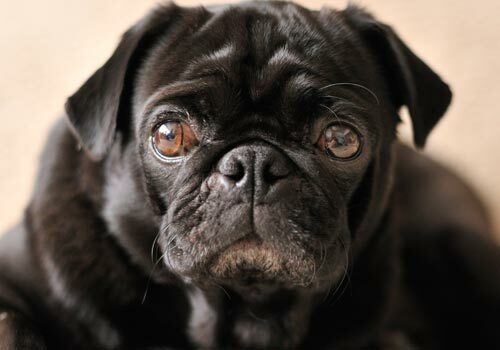 All dogs evolved as carnivores and Biologically Appropriate foods mimic the foods Mother Nature intended them to eat! 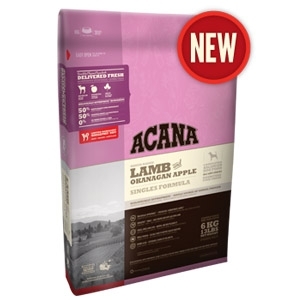 That’s why ACANA Lamb & Okanagan Apple is loaded with 50% lamb, to nourish your dog according to his biological adaptation to a meat and protein rich diet. All dogs evolved as carnivores and Biologically Appropriate™ foods mimic the foods Mother Nature intended them to eat! 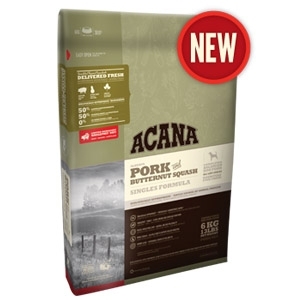 That’s why ACANA Pork & Butternut Squash is loaded with 50% pork, to nourish your dog according to his biological adaptation to a meat and protein rich diet. All dogs evolved as carnivores and Biologically Appropriate foods mimic the foods Mother Nature intended them to eat! That’s why ACANA Duck & Bartlett Pear is loaded with 50% duck, to nourish your dog according to his biological adaptation to a protein rich diet. 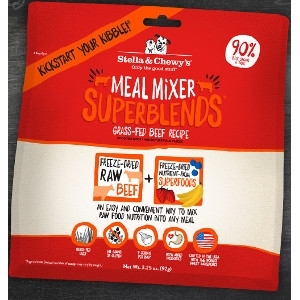 The ultimate food mimics the one Mother Nature intended your senior dog to eat! 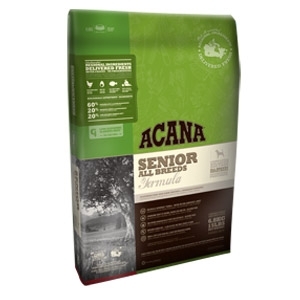 Made with a full 60% of nourishing chicken, eggs and fish, ACANA Senior matches your dog’s evolutionary adaptation to a meat & protein rich diet. 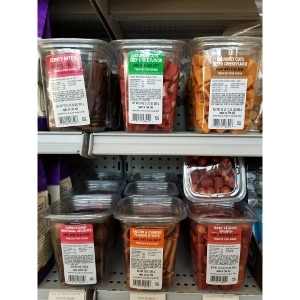 ACANA’s rich variety of fresh, local meats mirrors the diversity and freshness Nature intended for your senior dog. 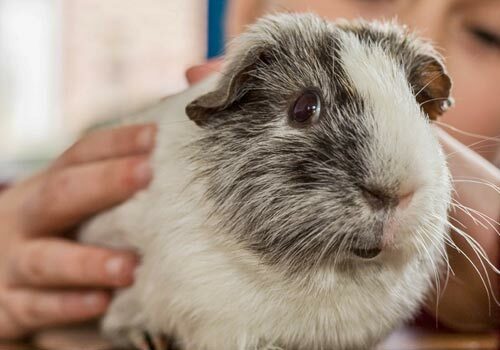 The ultimate food mimics the one that Mother Nature intended your puppy to eat! Loaded with 60% of chicken, fish, and eggs, ACANA matches your puppy’s evolutionary adaptation to a meat and protein rich diet. ACANA‘s rich variety of fresh meats mirrors the diversity and freshness Nature intended. 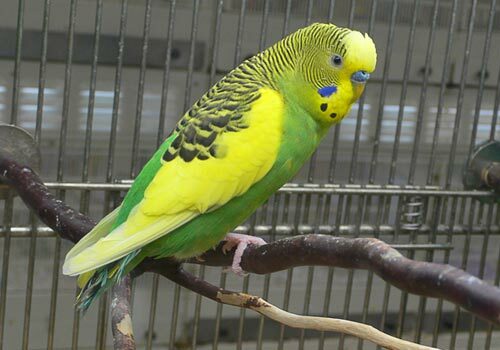 The ultimate food mimics the one Mother Nature intended your dog to eat! 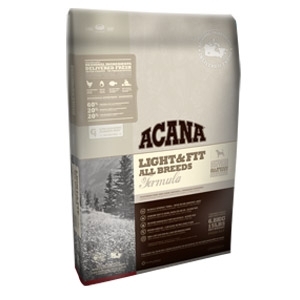 Made with a full 60% of nourishing chicken, eggs, and fish, ACANA Light & Fit matches your dog’s evolutionary adaptation to a meat & protein rich diet. 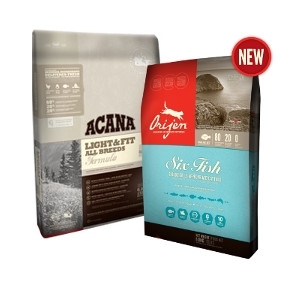 ACANA’s rich variety of fresh, local meats mirrors the diversity and freshness Nature intended for your dog. 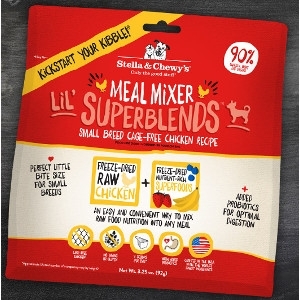 The ultimate food mimics the one Mother Nature intended your active dog to eat! Loaded with 65% of nourishing chicken, fish, and eggs, ACANA matches your dog’s evolutionary adaptation to a meat and protein rich diet. ACANA‘s rich variety of fresh meats mirrors the diversity and freshness Nature intended. 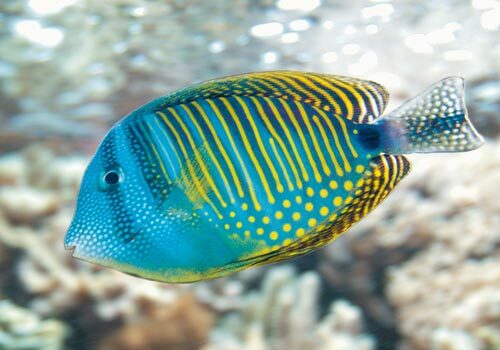 The ultimate food mimics the one that Mother Nature intended your dog to eat! Loaded with 55% of chicken, fish, and eggs, ACANA matches your dog’s evolutionary adaptation to a meat and protein rich diet. ACANA‘s rich variety of fresh meats mirrors the diversity and freshness Nature intended. 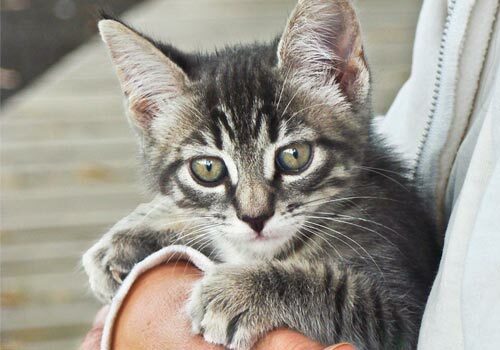 The ultimate food mimics the one that Mother Nature intended your puppy to eat! 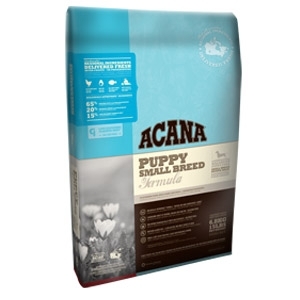 Loaded with 55% of richly nourishing chicken, fish, and eggs, ACANA matches your puppy’s evolutionary adaptation to a meat and protein rich diet. ACANA‘s rich variety of fresh meats mirrors the diversity and freshness Nature intended for your puppy. 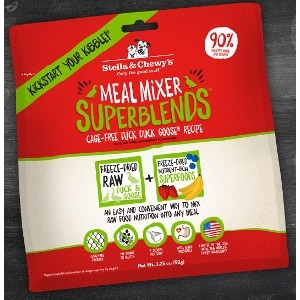 The ultimate food mimics the one Mother Nature intended your dog to eat! 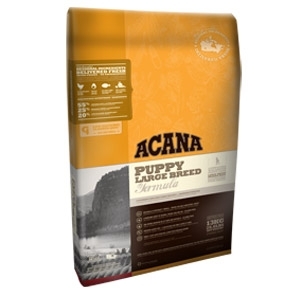 Loaded with 65% of meat (about twice as much as conventional puppy foods), ACANA matches your puppy’s evolutionary adaptation to a meat and protein rich diet, while its fresh meat variety mirrors the diversity and freshness Nature intended. Reflecting Alberta’s ranching heritage, ACANA Ranchlands is loaded with local red meats, including Angus beef, lamb and bison all free-range and delivered FRESH each day to nourish your dog completely. Made with a full 60% of nourishing red meats and fish, ACANA Ranchlands matches your dog’s evolutionary adaptation to a meat & protein rich diet. 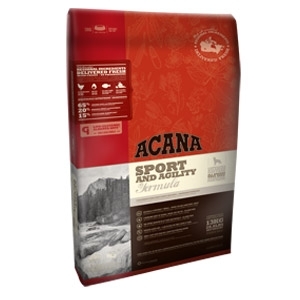 ACANA’s rich variety of fresh, local meats mirrors the diversity and freshness Nature evolved your dog to eat. 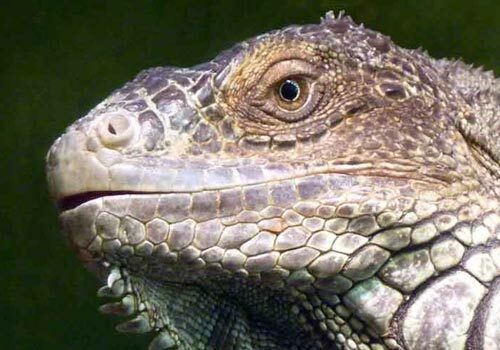 The ultimate food mimics the one Mother Nature evolved your dog to eat! Made with a full 60% of nourishing fish, ACANA Pacifica matches your dog’s evolutionary adaptation to a protein rich diet, and a variety of fresh, local fish reflects the diversity and freshness Nature intended your dog to eat.